2224 soybean oil and cottonseed oil, bulk, and 1,500 mt of frozen chicken, Grade A. Road, London W14 8SZ, England. Telex: 8814987. Phone: 01-602 6038. Liverpool. Bank ref: National Westriinster Bank, 55 King Street, Manchester. Manchester M16, England. Telex: 24224 REF: 3108. Phone: 061 226 5115. 27 Jalan Limau Kasturi, Bangsar Park, Kuala Lumpur, Malaysia. Park Avenue, London W11, England. Telex: 935603. Phone: 01-229 3086. 4241, Seoul 100, Korea. Cable: BIGROUND Seoul. Phone: 260-260l/2. or 265-2842. ESTACAO AGRARIA. Phone: 22558 or 22553. .... .... U ~,r./. of Fl r :. 2233- Ingredients for animal feed (Malaysia). Wishes to contact' U.S-upplipr L D ..
Lumpur. Contact: Francis Cher, Syarikat Chang Cheng (M) SDN. BHD., 19-21 JLN. Overseas Union, Klang Road, Kuala Lumpur, Malaysia. Telex: MARCH MA 31392. Cable: 'LONGMARCH KL'. Phone: (03) 732-723. Sukhumvit 26, Bangkok 11, Thailand. Phone: 252-7797. C, Tegucigalpa, D.C., Honduras. Cable: INDAVISA. Portugal. Cable: FARCHEM. Phone: 53 94 54; 57 28 26. Biagi 0. SPA, Via Provinciale Lucchese, Borgo A. Muggiano, Pistoia, Italy. Telex: 570550 BIAGI I. Phone: 0572/30216. C&F Red Sea or Arabian Gulf. Bank ref: Vereins-UND Westbank Ag, Hamburg. ALRA D). Cable: ALRAMID Hamburg. Phone: 040 38 12 21. Santiago, Chile. Contact: Miguel Icekson, Casilla 2714, Santiago 1, Chile. Phone: 80091, Santiago or 1 Las Vertientes, Santiago. C&F Guayaquil. Contact: Ing. Jorge Garcia, Mgr. 10. Sumesa CIA. LTDA., P.O. 2249- Canned fruit and vegetable juices, nectars & concentrates, soft drinks (France). canned vegetable juices and soft drinks bottled and canned. Contact: Mr.
sorts of canned vegetables fruits and juices. Quote all prices C&F Jeddah. 1290, Jeddah, Saudi Arabia. Telex: 401660 JKECTGT SJ. Cable: JAMIL KOHGEER. chocolate), and frozen meat: beef. Bank ref: Bank of America (Taipei). HWA S. Rd. Taipei. R.O.C., Taiwan. Telex: 11055 YUANPAO. Phone: (02) 7524567.
minimum, fiber 70' maximum, moisture 12" maximum, fat 0.5% minimum for Korea. 1412 Broadway, New York, New York 10018. Phone: (212) 221-6199. 2264 Peanuts (England). Wants up to 100 mt tons per season of unshelled peanuts, U.S.
slaughtered according to Islamic Rites, each bird polypacked with weight indicated. Foreign Trading Co., P.O. Box 1001 Alexandria, Egct, Telex: -057 GOMALX UN. Cable: KILANISWAIF, ALEYANDPIA. Phone: AI: Ja. 2266- Catering line of foods (Egypt). IPtereSte:' in ::teri lie (dry, canned) and. El Nil Maspero, Cairo, Egypt. Telex: 92395 SHADI UN. Phone: 759544. Gaish St., Bab El-Shariah, Cairo, Egypt. Phone: 937885/910083. Azikiwe Street, P.O. Box 811, Lagos, Nigeria. 50 lb cartons. Delivery one half in Jan. balance in May. Quote CIF Piraeus. 215797 ASCO GR. Phone: 3243961. Tokuyo Sogo Bank, Sapporo Branch, Nishi 1, Odori, Chuo-Ku, Sapporo 060, Japan. 9-Chome, 12-Jo, Shin Kotoni, Kita-Ku, Sapporo 001, Japan. Phone: 011-762-2343. 2281- Canned meats, salad dressings, canned fruits and vegetables, wines (Honduras). Apartado Postal 738, San Pedro Sula, Cortes, Honduras. Phone: 520366. D). Phone: 04161-2196 or 04161-52551. 02-15715 (ANSWER BACK: ITOC D). Phone: 040-44 17 31.
malt (dark). Sample basis (200 grams by air). In bags of 50 or 100 kilos net. Ihle, Brewmaster, Granitweg 20, D-2000 Hamburg 65, Germany. Phone: 040-602 34 21.
intervals; (2) 150 tons of concentrates/premixes delivered at 2 month intervals. Managing Director, Trufaith Co. Ltd., 3/5 State Avenue, Calabar, Nigeria. container trial order and, if quality satisfactory, monthly purchases thereafter. C.T. Wang, General Manager, Hornet Trading Co., Ltd., No. 337, Dah Chu Road, P.O. Osaka 544, Japan. Cable: ISHISEWCO, Osaka. Phone: 06-751-6861. Venezuela. Cable: 'UPRAGUA. Phone: (083) 31401.
will supply artwork. Delivery February, 1980. Quote C&F Venezuelan port. Adolfo Fratti, 12 Calle "A" 11-39, Zona 1, Office 207, Guatemala City, Guatemala. 2302 Red beans (Guatemala). Wants 10,000 tons of red silk beans guaranteed U.S.
Del Agro, 9A. Calle 5-39, Zona 1, Guatemala City, Guatemala. Contact: Ing. 5168 CAMWI GU. Phone: 68-02-62. 727, San Salvador, El Salvador, Central America. Cable: Cabra. Phone: 23-2074. (AID), Washington, D.C. (202) 235-8862. Gulf). Phone: 25251. 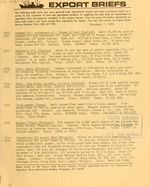 Telex: 4168 DH. Cable: AL KHALEEG Doha. above products. Contact: Michael International Agencies (Nigeria) Ltd., P.O. Box 5586, Lagos State, Nigeria. ALAF, 11089 SY. Cable: ALAF, Damascus. Phone: 221689 and 221983. April. Pork which has already cleared customs will be placed in "isolation"
a virtual embargo on pork sales to Japan until at least April 1980.
meters selling for $1800., and some larger areas still available upon request. about the exhibit, contact Wilhelm Kosnopfl, Assistant Director, MIATCO, 300 W.
Washington St. Suite 710, Chicago, Illinois 60606. Phone: (312) 368-4448. Food Safety and Quality Service (USDA) Meat and Poultry Inspection.